On days when you'd rather be tucked up at home, this is what to wear to work on a rainy day. When you live in commuter land and it's winter, there's the possibility that you will have a couple of miserable days. While I hate the thought of having a full day of feeling horrible - I don't want that for any of you - it's inevitable when your hair is frizzy and your shoes and socks are soaking. Dressing for work is a challenge any day of the week, but it's so much worse when the weather outside is frightful. But we think we've figured out the formula for what to wear to work on a rainy day. Read why we thought Kate Middleton's outfit was workwear goals. There are two very important elements to the rainy day work outfit: your shoes and your coat. I think one of the most important items in your wardrobe is a really good raincoat, but one that's somewhat professional. It has to have a hood, though; the majority of rainy days in Ireland coincide with windy days making umbrellas null and void. As for the footwear, I recommend bringing a spare. You may not look like a high-powered business lady on your bus or train journey or your walk in wellies, but your feet will be dry and that's way more important. You could wear knee-high flat riding-style boots, but you risk damaging them if the weather is especially rough, and they are never 100% water-proof. Check out this raincoat I found in Topshop. It is perfect for this type of sitch. If I wake up to rainy weather and have a 30-minute walk ahead of me, I always wear a skirt or dress outfit. I pop on black tights and bring a spare pair in case it's really rainy. I bring my high-heeled ankle boots in my bag and wear the pair of Chelsea rain boots I bought in Penneys three years ago - they're still going strong. 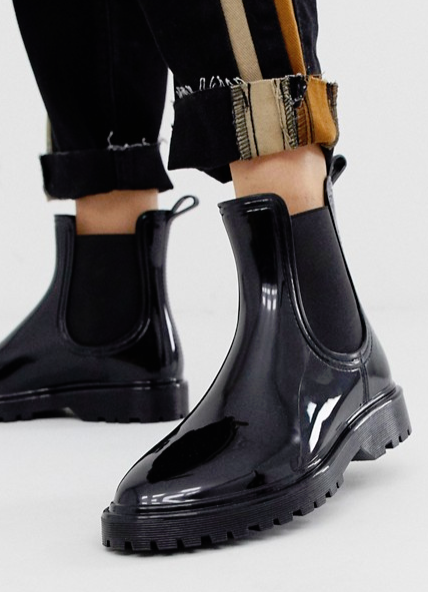 They might release some again this year on the way up to festival season, but until then, you can find some 'fashion' wellies on ASOS. What do you wear to work when it's raining? Are you lucky enough to be able to drive door to door?